It’s 8:15, Do You Know Where Your Kids Are? Living next door to my brother is extremely helpful. However, I’m sure he does not want to chase goats four times in 48 hours. Donning my overalls, gloves, cap and with pliers in hand, I managed to rope Mary Poppins as she bleated as if I was hurting her. She slipped the rope, and I called Kelly. “Will you come help me catch Mary Poppins?” I asked when he answered the call. “Sure” He replied and I started devising a way to capture the kid. I managed to grab her back leg. She screamed in shock, and I picked her up. As I tossed her over the fence, she twisted and head-butted my nose. It wasn’t bleeding. Then Kelly showed up we walked the fence line looking for breaks. Goat capture was not on my agenda for the day. Add in laundry, dishes, a request for a video of goat captures, and church…then fast-forward five hours. In the waning hours of the day, I checked the goats. I found that I was 3 goats shy of a full herd. So, I texted to my friend Diane, “2 escaped. 1 stuck.” Fence pliers in hand, I called her, “Where are you? I’ve got two escaped and one stuck in the fence. You asked for video, now it’s your time to shoot the video.” I laughed and she said that they were enroute home from a day trip. With Jim at work for another hour, I figured that I could at least get one escapee back in the fence solo. I went into analyst mode and decided on a process flow. First, Betty White needed to be freed from the fence. After she stuck her head through the 4×4 fence, her horns got stuck. Suddenly faced with pliers, she magically backed her head out of the fence; she was toying with me hoping for a handful of grain. Second, I managed the grab Queen Lillian and tossed her over the fence. I heard Scooby barking as I tripped on a tree root chasing Mary Poppins. Counting down the minutes until Jim arrived home, I patiently followed Mary Poppins through the briars. In the darkness, I heard, “Hey! 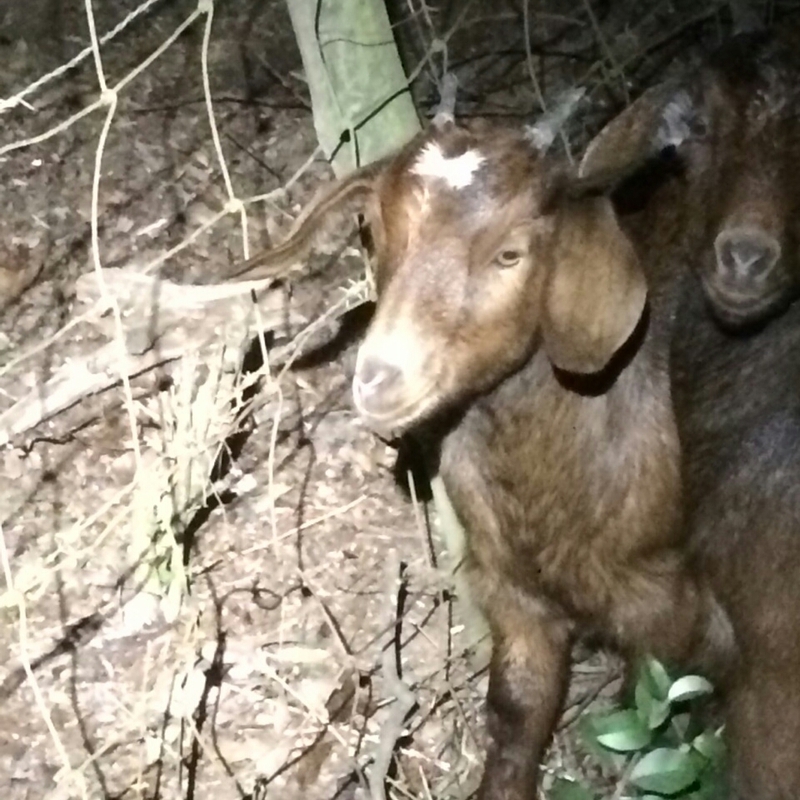 The goat capturers are here…how do we get to you?” I looked up and asked, “who’s there?! Diane?” Sure enough Diane and her husband walked around the barn and helped snag Mary Poppins. They had been in the area and gladly helped with the escapee. Thus ended Sunday. He asked, “Yes, did you get the pictures?” I looked at my phone and saw two little brown goats on the wrong side of the fence…again. Twins are double-trouble. 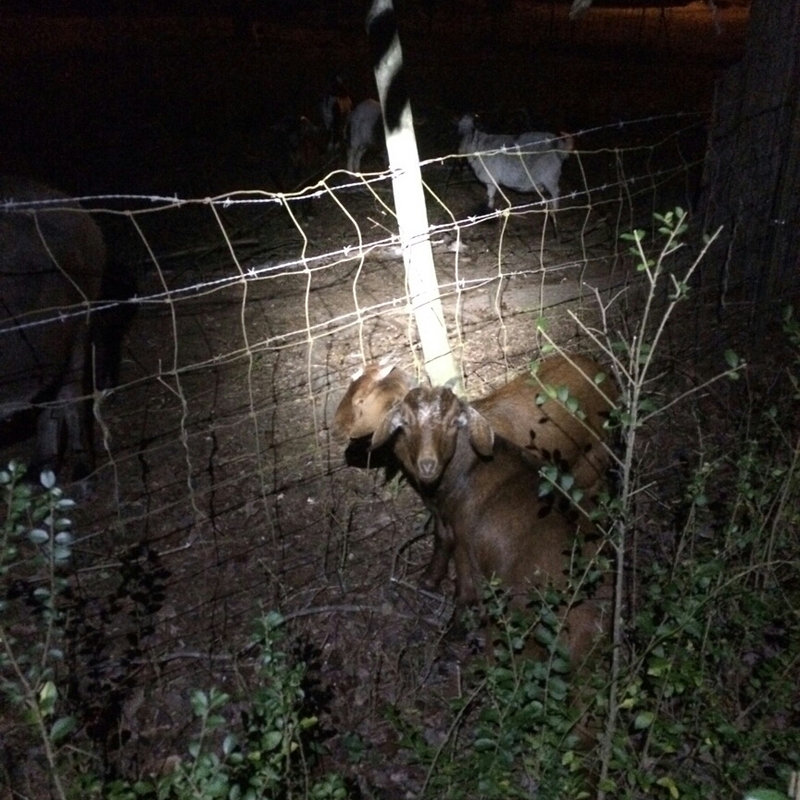 My sister-in-law heard a goat screaming and Kelly found the twins breaking fences again. We repaired the fence, replaced the goats and shook our heads. You might be a goat farmer when you consider a “vacation” day from the office to be a date. Just in case you ever wondered what we do on personal days, we usually do farm stuff. Photos courtesy of Kelly Reep 2016. All rights reserved by Raisedbyavillage.com.